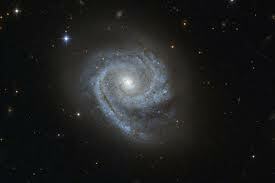 NASA’s Hubble Space Telescope captured the image of the spiral galaxy known as ESO 498-G5. One interesting feature of this galaxy is that its spiral arms wind all the way into the center, so that ESO 498-G5’s core looks like a bit like a miniature spiral galaxy. This sort of structure is in contrast to the elliptical star-filled centers of many other spiral galaxies, which instead appear as glowing masses. Astronomers refer to the distinctive spiral-like bulge of galaxies such as ESO 498-G5 as disc-type bulges, or pseudobulges, while bright elliptical centers are called classical bulges. Observations from the Hubble Space Telescope, which does not have to contend with the distorting effects of Earth’s atmosphere, have helped to reveal that these two different types of galactic centers exist. These observations have also shown that star formation is still going on in disc-type bulges and has ceased in classical bulges. This means that galaxies can be a bit like Russian matryoshka dolls, classical bulges look much like a miniature version of an elliptical galaxy, embedded in the center of a spiral, while disc-type bulges look like a second, smaller spiral galaxy located at the heart of the first, a spiral within a spiral. ESO 498-G5 is located around 100 million light-years away in the constellation of Pyxis (The Compass). This image is made up of exposures in visible and infrared light taken by Hubble ’s Advanced Camera for Surveys. The field of view is approximately 3.3 by 1.6 arcminutes.